STORMONT leaders who have failed to deliver any of an £80 million poverty fund to the poor, have paid nearly £400,000 of the money to consultants, it has emerged. The deprived communities who were supposed to benefit from the Social Investment Fund (SIF) have not received a penny since it was launched in 2011, and while red tape has caused difficulties, there also appears to be a political stand-off over whether more of the money should go to Protestants or Catholics. Government data confirms poverty exists in both the unionist and nationalist communities, but is more widespread among Catholics, meaning nationalist areas would receive a larger share of the money if it is allocated on the basis of need. The DUP has declined to comment on whether this is at the heart of the deadlock, as first reported here by The Detail, but Sinn Féin confirmed its position and said: “It is our view that SIF monies should be allocated on the basis of need." As the political wrangling continues, and as community groups confirmed the delay is undermining their work in deprived communities, it has now emerged that a substantial portion of the fund has been paid to consultants and administrators. The Office of First Minister and Deputy First Minister has confirmed in answer to an Assembly question tabled by UKIP representative David McNarry that it has spent £389,847 of the SIF money to five consultancy companies and civil servants as part of the process of setting up the fund. Mr McNarry said grassroots groups would be “shocked and appalled” that while political leaders have failed to deliver money to deprived communities, government has spent such a large amount of the fund on consultancy work. “This is really going to knock the stuffing out of groups across the community,” he said. “I think they will be shocked and appalled because the problem is, not only have the communities received nothing, they have no indication when they are going to start to receive funding. He said there was deadlock between the DUP and Sinn Féin at the top of government. “This is not the Office of First Minister ‘and’ Deputy First Minister, as it is officially called. 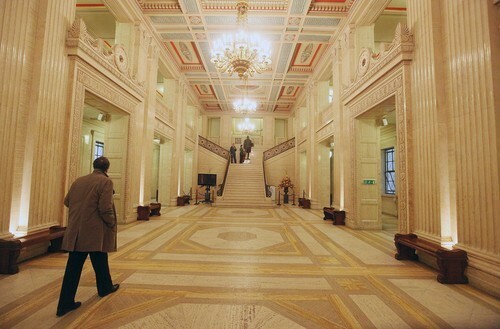 “This is the Office of the First Minister ‘or’ the Deputy First Minister. “They are not working in unison in this office. “The leaders need to get a hold of it and start running this office. The Detail spoke to sources close to the fund, and secured a letter of complaint from some of those who were appointed to administer it, which all indicated there was a political row over defining ‘need’. Both the DUP and Sinn Féin accept that deprivation exists on both sides of the community, but in the past they have argued over how that should be addressed when it comes to funding. Unionists have, however, argued that deprived Protestant communities suffer particular problems that need to be taken into consideration, including suffering pockets of deprivation in otherwise affluent areas. The Detail has examined the deprivation figures here. Mr McNarry said he was aware of problems faced by deprived unionist communities who needed assistance to create social enterprise projects, and to develop schemes of a kind that were already in place in nationalist areas. The Detail first approached the DUP with the allegations on the deadlock over the Social Investment Fund last Thursday, October 17. The party was provided with three days to answer, but declined to comment. But it is known that the DUP and Sinn Féin have discussed potential deals, on the basis of the substantial number of projects civil servants have already signed off for funding from the SIF. In addition, the letter of complaint written by individuals close to the fund, who liaise with officials in the Office of First Minister and Deputy First Minister (OFMDFM), also indicates that sufficient numbers of projects have been finalised to allow politicians to begin to release funding. It is also the case that, on the basis of OFMDFM’s own original timetable, spending should be well under way. When SIF was launched in March 2011 it was to spend £80 million within four years – a pledge written into the Programme for Government. It was planned that by today’s date, deprived communities should have received more than £50 million from the fund, but they have received nothing. Meanwhile, Stormont Finance Minister Simon Hamilton of the DUP revealed today, that because OFMDFM was unable to spend £15 million made available to it in this financial year for capital projects under the SIF, it has now been reallocated to other areas of government.